The story of Lazarus and the Rich Man goes that a poor beggar, Lazarus, is laid at the gate of a rich man. He is covered in sores and longs to eat the scraps off the rich man’s table. When Lazarus dies, angels carry him off to Abraham. After the rich man is buried, he finds himself tormented in Hades. (Luke 16:19-31) The message is clear: beware of earthly riches. But its meaning vacillates between imminent, universal death and a lesson on how to live. Still Life with a Bouquet and Skull, Adriaen Van Utrecth, 1642. The memento mori genre was expansive. Clocks and watches extolled similar messages of “tempus fugit,” or time flies, reminding of life shortening with each passing minute. Poetry, funerary sermons, music, and literature on how to die (artes moriendi) proliferated. The outpouring of art to cope with the inability to escape death, memorialize the dead, or convey religious beliefs about the afterlife reflected a variety of attitudes and cultural traditions regarding death in the twelfth through fifteenth centuries. Burial of the dead offered another opportunity for artistic and emotional expression. Medieval transi or cadaver tombs depicted the deceased individual as a decaying corpse, occasionally including details such as worms eating away at the body. 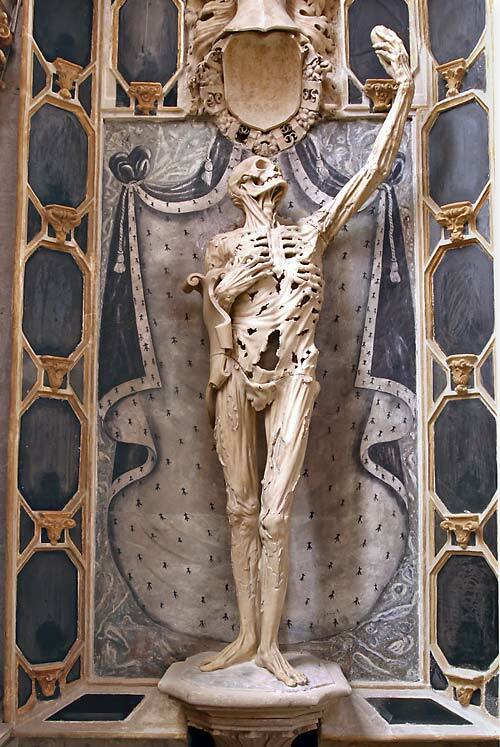 Cadaver tomb of Rene de Chalon. Sculptor Ligier Richier, 1547. A departure from earlier tombs depicting the individual in life, cadaver tombs of the fourteenth century also depicted the deceased as a rotting corpse, and occasionally did not include the image of the living at all. Given the expense of monumental architecture, cadaver tombs were usually commissioned for only those who could afford it, such as nobility or high-ranking bishops and abbots. This was particularly so for those given places in a church. The wealth of the deceased juxtaposed with his or her effigy as a cadaver created a powerful memento mori message. As in the story of Lazarus and the Rich Man, cadaver tombs not only reminded the viewer of inevitable death, but also encouraged contemplation on how to live. The transi flourished in the fourteenth through the eighteenth century, gracing the tombs of Catholic Popes Urbanus VIII and Alexander VII. Michelangelo had one painted over the staircase of his home – a skeleton carrying a coffin on his back – at 8 Macel de’ Corvi, where he spent the last twenty years of his life. Although cadaver tombs vary greatly by region and era, the thread that ties is their evoking of the transience of earthly riches. The tale of the three living / three dead may have also influenced the development of the danse macabre, “or dance of death,” although other scholars trace its origins to the twelfth century poet Helinand. In these depictions, death dances with everyone, quite literally. In the form of a skeleton or grim reaper, death has a metaphorical encounter the living, often gleefully carrying off the poor and wealthy alike. The proliferation of these illustrations allowed deeper examination of the slightly but nonetheless distinctly different meanings of the memento mori. 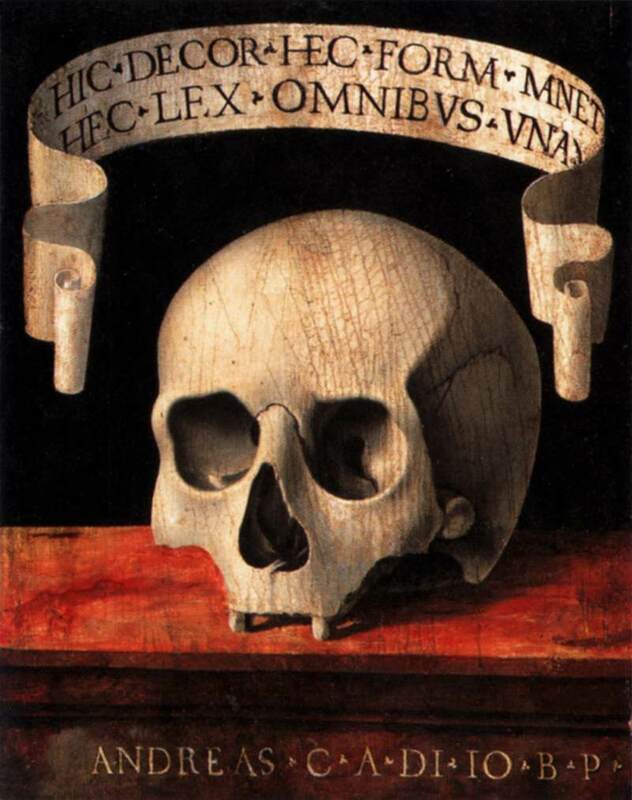 A particular systematic study of 500 dance of death depictions between 1400 and 1800 by Johan Mackenbach and Rolf Dreier found important variations in the instructional message of the memento mori by chronological and geographic area. In the early danses macabres, undercurrents of discontent with religious leaders and the state of social inequality crept into the art. 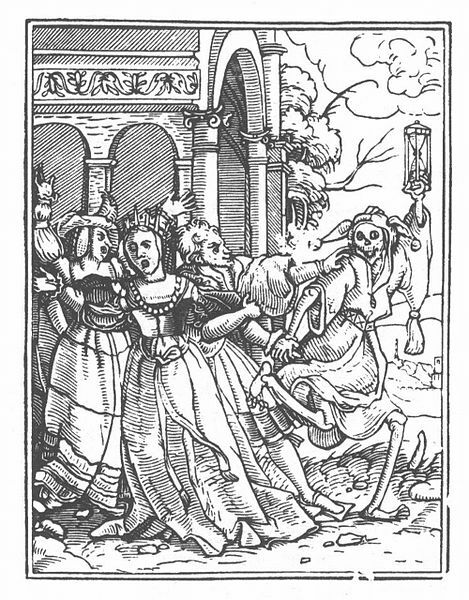 Fifteenth century, pre-Reformation dances of death offered a pointed social critique showing death carrying off the rich and the poor alike, indicating all were equal before death. Dance of Death, German printed edition Chronicle of the World (Hartman Schedel, Nuremberg, 1493). Artist believed to be Michael Wolgemut. Material inequalities contradicting the notion of all being equal before death gave rise to further public criticism, and the Danse Macabre morphed into satirical depictions of corrupt leaders and the failures of authority, contrasted with the diligent, impoverished farmer. The critique of religious leaders was occasionally incorporated into sermons of Dominican and Franciscan friars illustrating the importance of rejecting of material possessions, observing biblical dictum, and contemplating sins before death. 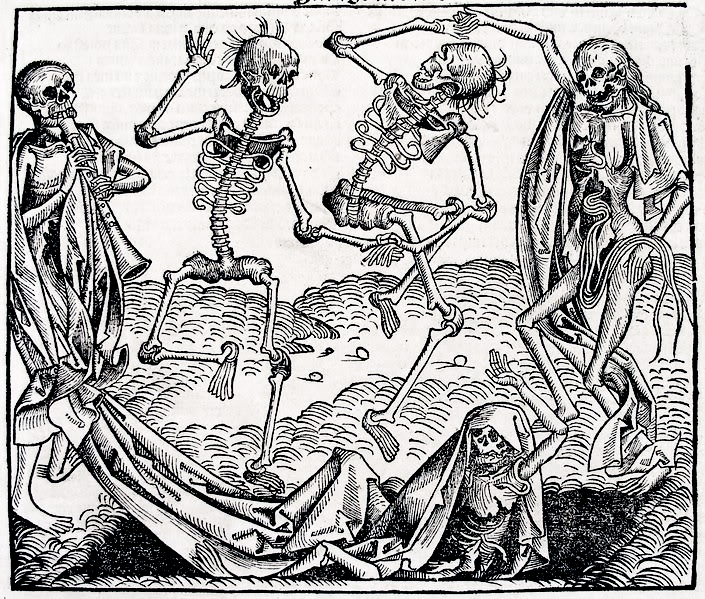 The critique of pre-Reformation dances of death culminated in Hans Holbein’s Dance of Death (Bilder des Todes), which was a series of wood engravings carved in the 1520s and published in 1538. The book of engravings became one of the most famous danse macabre studies depicting scenes from Creation and Temptation through the Last Judgment. In the image shown, Holbein shows Death dragging a Queen (to the underworld), gaily dancing with an hourglass, a symbol of the vanitas. These dances of death served pre-Reformation aims advocating religious reform and joined a long history of social critique through art. Danse Macabre XI, The Queen, Hans Holbein, 1526-1538. After the Reformation in 1525, Mackenbach and Dreier found the danses macabres put away their sharp knives of broad social critique and increasingly became a vehicle for theological debates between Roman and Lutheran and Calvin reformers. Dances of Death reflected the definitive split between Catholics and Protestants, and Protestants commissioned many dances of death critical of Catholic clergy and doctrine. The dances of death were often acted out in plays and painted in church frescoes across the European continent. In the beginning of the seventeenth century, dances of death reincarnated once again, this time by the Catholics encouraging a message of confessional strife. These paintings and prints appeared in German-speaking areas of southern Germany, Austria, and Switzerland, used by the Catholic Church as a memento mori, reminding believers of the importance of piety for salvation. Whether implying that all are equal in death, before death, or invoking religious principles, these danses macabres conveyed that the dead have something to tell the living. Portable relics as reminders of death and late family members also emerged from the medieval and early modern memento mori art. Hair jewelry of the seventeenth and eighteenth centuries offered a transportable version of the messages inscribed in tombs and paintings, and Victorian mourning jewelry in particular often incorporated hair from, or cameos of, the deceased. These personal reminders of the fleeting nature of life continued into the nineteenth century with postmortem portraits, considered a precursor to a heavenly reunion with the deceased family member. Victorian postmortem photographs allowed families to acknowledge and mourn the death of a loved one, particularly children, who were often placed in a position of peaceful sleep. However, as photography emerged as a new form of visual art, ritual postmortem photographs fell out of favor, concurrent with the extensive mortality of the First World War. Whereas once wars, disease, and daily struggles nurtured an outpouring of expression, it now ushered in a new era of stoic pragmatism. Nevertheless, memento mori art did not die in the twentieth century. Pablo Picasso’s Death’s Head, Hans Thoma’s Memento Mori, and Andy Warhol’s Death and Disaster series, among others, continued to exhibit reflections on death through the mid-twentieth century. As memento mori art has reincarnated with new meanings during different political and religious climates, what are our contemporary memento moris? Philadelphia’s Mutter Museum should be considered a Mecca for such specimens. Joseph Leidy’s leather-bound Elementary Treatise on Human Anatomy resides in a glass case in its rooms. Published in 1863, the curiosity of the book is not only it’s age, but also the composition of the leather – it is made from tanned human skin. Three additional specimens of human hides are displayed in the cases nearby – “cherished possessions” of Dr. Leidy and of another nineteenth century physician, J. Stockton Hough. Although to modern visitors, the use of a person’s skin may appear ghoulish, the placard explains Leidy’s intention to honor the memory of those who had served as subjects for medical anatomy. The leather books are displayed next to a wall of skulls, one of the largest museum collections of human skulls and skeletal remains. Other specimens preserved from death also fill the museum: skeletons of dwarves, giants, and ladies whose ribs were pulled together by corsets, the “soap lady” whose skeleton was preserved by her adipose tissue, human hair balls extracted from a stomach, diseased intestines, and limbs shattered by bullet wounds. Yet the placards do not discuss death or dying. Instead, they report a different instructive message: these curious remains were originally displayed to advance medical knowledge in the nineteenth century, and more recently, to offer knowledge regarding the extremes and possibilities of the afterlives of human bodies that we rarely encounter today. Skeletons similarly appear in the portrait of the late Mutter Museum curator, Gretchen Worden. A skeleton stands behind her, and upon closer inspection, another is also in the foreground. But Worden’s portrait is not intended to evoke death. Instead, the artist says it was intended to celebrate Worden’s work in the museum with two of her favorite skeletons – a dwarf and a giant. The extensive collection of skulls and bodily specimens, with their underlying but unacknowledged presence of death, begs the question: with wonder drugs, deaths more often occurring in hospitals rather than the home, and the movement of cemeteries to the outskirts of cities, is death disappearing from everyday contemplation? Have modern American values changed or has our increasingly secular society failed to orient us toward an old muse? Death is certainly not invisible today – we can see it in the image of the skull and cross bones symbolizing death in the Poison Control Center logo. 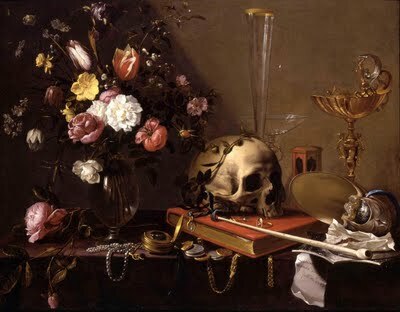 There is a Vanitas app for smartphones, harkening back to the medieval symbols that “all is vanity.” Skull scarves and jewelry continue to bear death’s emblem, whether or not the wearer recognizes its significance. Attitudes toward death are studied by clinicians and epidemiologists, and although we often use watches as a means to stay on schedule, you can purchase one with the words “remember you will die” written above the watch hands. The “Last Lecture” series offers imagined final advice from professors, which more directly instructs how to live. As remembrances of death reincarnate in smartphone apps and purchasable goods, we see a new portrait of society’s attitudes toward death. Perhaps our modern memento mori has transformed from life as a prelude to life as the main performance. Yet, like the variety of attitudes toward death in the Middle Ages, it is unlikely we have a monolithic “modern” view on what death means. Death’s presence, or lack thereof, offers a glimpse into new questions about what it means to remember the dead and the inconstant balance of attraction and resistance to the transience of life on earth. Caciola, Nancy, “Wraiths, Revenants, and Ritual in Medieval Culture,” Past & Present, No. 152, (August 1996); p. 3-45. Nickerson, Angela K. A Journey Into Michelangelo’s Rome (ArtPlace Series). Berkeley, CA: Roaring Forties Press, 2008, p. 104. Emile Male, Religious Art in France: The Late Middle Ages. A Study of Medieval Iconography and its Sources, ed. Harry Bober, trans. Marthiel Mathews (Princeton,1986); p. 327, in Caciola, “Wraiths, Revenants, and Ritual in Medieval Culture,” Past & Present, p. 24. Kiinstle, Legende der Drei Lebendenundder Drei Totenundder Totentanz; and Kurtz, Dance of Death and the Macabre Spirit in European Literature, in Caciola, “Wraiths, Revenants, and Ritual in Medieval Culture,” Past & Present, p. 25. Male, Religious Art in France, p. 329-30, in Caciola, Wraiths, Revenants, and Ritual in Medieval Culture,” Past & Present, p. 25. Mackenbach, Johan Pieter and Rolf Paul Dreier. “Dances of Death: macabre mirrors of an unequal society,” Int J Public Health (2012), 57:915-924. Greetings I am so delighted I found your weblog, I really found you by mistake, while I was looking on Askjeeve for something else, Anyhow I am here now and would just like to say cheers for a marvelous post and a all round interesting blog (I also love the theme/design), I don’t have time to go through it all at the moment but I have book-marked it and also added in your RSS feeds, so when I have time I will be back to read a great deal more, Please do keep up the excellent work. Pingback: Tidying the playhouse | What would the Wertis say?